The Squeezor is a monster who loves to give hugs. Great, big wrap-his-arm-around-you-twice, squeezy hugs. Oh. My. Gosh. I’m SO in love with this one. 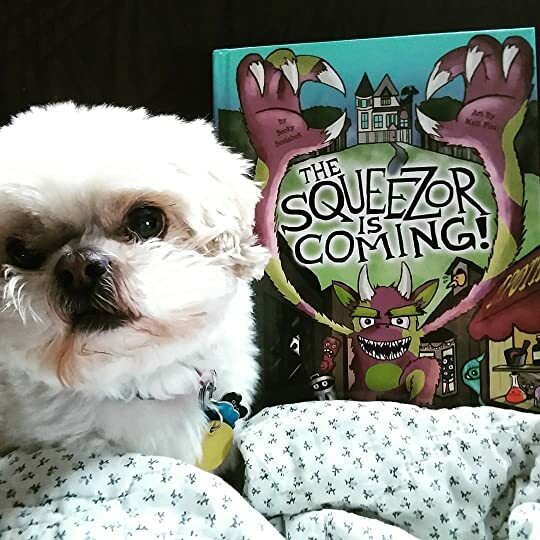 The Squeezor, a furry little monster, is a delightfully friendly little fellow…well…sort of. He’s friendly…but he doesn’t look friendly. The trouble is, the Squeezor doesn’t look like he wants to give you a hug. He looks like he wants to eat you up! The poor Squeezor becomes very lonely and doesn’t know what to do…until he comes up with an absolutely brilliant idea. And thus begins the Squeezor’s quest to make people like him – not by telling them he’s good but by showing. Slowly, ever so slowly, people begin to listen. I loved this one from cover-to-cover. The storyline was so sweet (but without falling into the goody-goody trap that so many children’s books do!). I loved all of the fun details Benishek puts in for the Squeezor – like how he watches Game of Bones or the fun items at the Apothecary (anybody up for scale softener? It comes in Regular, Premium and Unleaded!). All the little adventures that the Squeezor goes on are adorable – from reaching the top shelf for a little old monster to helping a vampiress sleep by closing her curtains. And the illustrations – WOW! I really feel like children’s books depend so heavily on the images – and this one does not disappoint! For example, all of the items in the Apothecary were so fun to look at (there’s even greeting cards with little sayings (What? and You’re Nice and I Like You are my faves!). This is truly an excellent novel – an absolutely perfect read!